465 deadly missions completed and now you simply made them disappear? I was greedy and I've lost several players on my watch. Now, how may this be compensated? Right, middle finger to those who played in these missions. Disclaimer: this is not as scientific as the splendid works of @OneLessTitan @blynknz and @Mark but it's more than just purely anecdotal. Instead of buying one of the weapon bundles offered this week I did an experiment buying the 24-hour gas booster to see if I could land a similar weapon for one-fifth of the price (but obviously with a lot of extra time spent). I played the equipment missions (lvl 18 recommended) that are no longer are deadly, thinking it would be my best shot. Played almost 250 missions, (was able to do 30-some per hour) and opened about 850 crates, using the free adds and a bit of gold to open extra crates at the best strategic times. @eetu has said these missions have been nerfed a bit after the deadliness was removed, and my conclusion is they are not worth the while at all anymore. If I had played XP exploration missions instead, I would have gotten 1.3 million XP more just from the story rewards. So...please bring back the deadlines. @TheLostOnes -- Good work, but sorry to hear about your results. I haven't done any of the once-deadly missions to check the drop rate of Gold/Silver tickets after the change; too busy in other types of missions working on my camp. I'm guessing your exploratory missions are Recommended Survivor Level 18 since you got one Level 18 Epic, so that stinks you didn't get to pull any Level 18 Legendary gear. I know they are possible in those missions, as I've pulled a few back when they were still deadly, but since the drop rate of Gold Tickets was probably halved after the nerf, the chances of getting them are just that much harder. I wish NG would remove most (or all) of the Rare gear from the Gold Crates...that would go a long way towards helping us find useable gear. @OneLessTitan yes, level 18 recommended. PS I just played an XP mission now and I got this. @TheLostOnes -- That's freaking awesome! I just got an Epic 18 Hunter Rifle, from a RSL 18 Guild Mission....had silver luck, but no large caliber trait! Maybe it's like Beetlejuice...say it 3 times and it starts showing up! 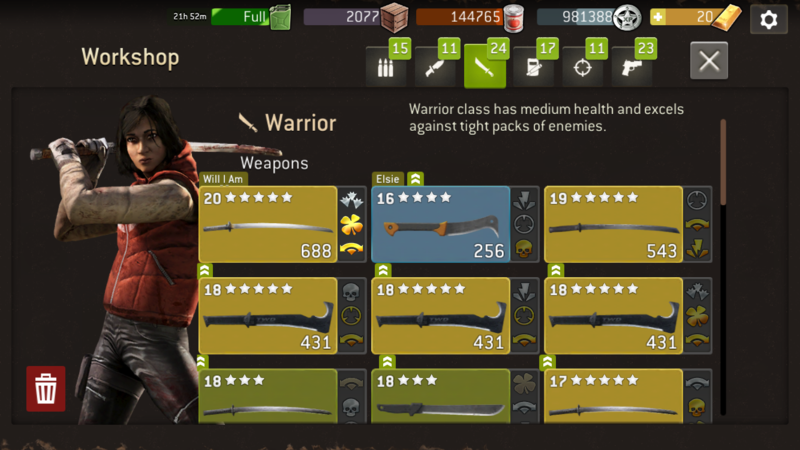 @OneLessTitan thanks, yes, that's a pretty good warrior weapon. 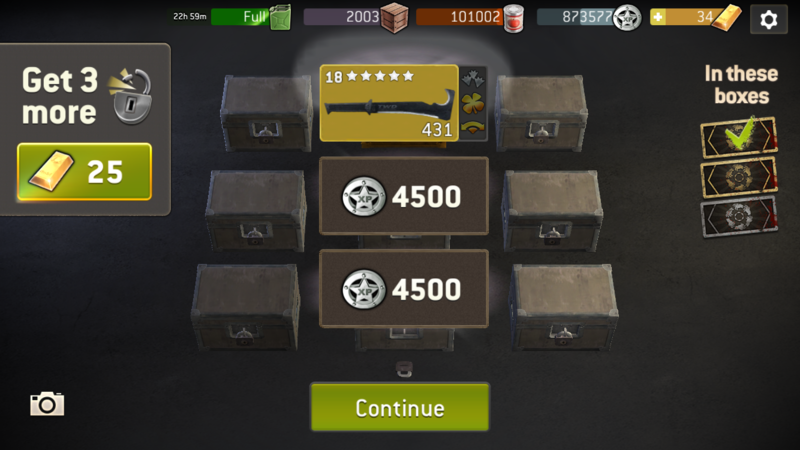 And I'm always happy when I get nice weapons even in this case where I won't be using it. For some reason I have always been lucky with warrior weapons. I now have 3 lvl 18 legendary choppers with gold arc that I will probably soon scrap. Planning to jump straight to upgrading my lvl 19 weapon when next council gets unlocked. PS my 24-hour gas run did give me 65 radios so there was some value for money. Really upset at the removal of deadly missions. Now there's literally no risk for harder missions. Removing them was a terrible decision. Yes, there were problems but they should have just fixed them instead of removing them. I would love to have deadly missions. With that being said I couldn't imagine losing a hero or legend that I have spent hours upgrading. The rest of the apocalypse has moved on already. Resurrecting dead threads is something we don't do here (check the rules).